Irelands Largest Mobile Storage Tanks! 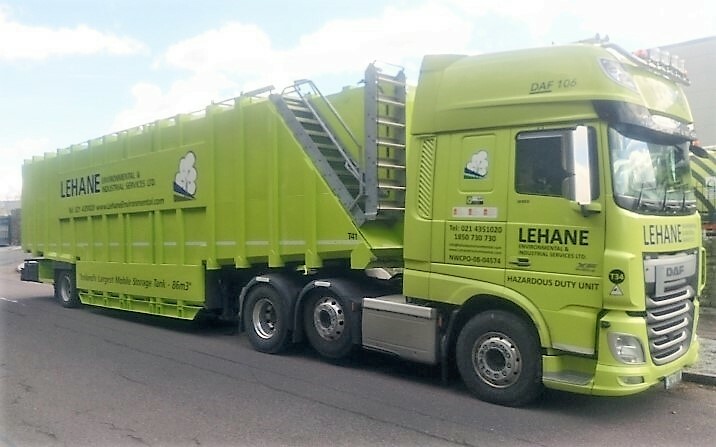 Lehane Environmental provides a range of on-site and off-site waste storage and treatment solutions. Our 86,000ltr tanks are ideal for projects which require a large volume to be stored whilst minimizing the footprint. These storage tanks store almost 3.5 times the quantity of a normal articulated storage tanker in the same footprint as a single storage tanker. These impressive storage tanks can be mobilised on their own or as part of a larger mobilisation with additional 25-86m3 Storage Tanks for both influent and effluent. We can also provide additional on-site treatment services such as pH adjustment and dewatering using flocculants. · Small footprint – Length 12.93m x Width 2.54m x Height 3.96m. Weight 26,200kgs Unladen. · Easy Cleaning Design – Top Access Manlids and Side Access Manlid Available. · Provision of waste tankering both on-site and off-site to facilitate works. 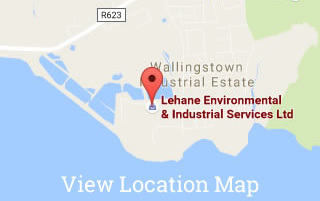 · Permitted throughout Ireland, Northern Ireland and UK for Haz & Non Haz Waste Collection.